One of the best things you can do to protect the exterior finish of your vehicle is to have paint protection film professionally installed on your car. Paint protection film keeps your car’s finish in a like-new condition, protecting it from chips and scratches from everything from road debris to bug splats. Years ago the only paint protection available was either removable auto bras or detachable bug guards, both an unsightly solution to the problem. But now there is a more effective, virtually invisible, permanent alternative. What is Paint Protection Film (PPF)? The paint protection film (stone guard, chip guard, etc.) 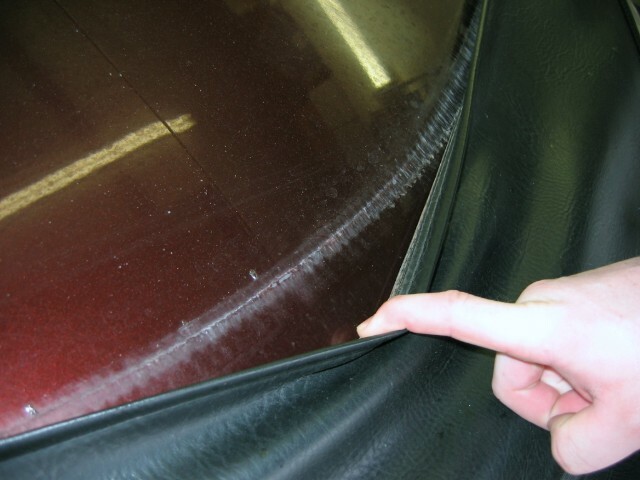 used by our technicians is an invisible film custom cut using computer software to produce protection that is custom cut to the exact specifications of your particular vehicle. Our premium quality 3M and SkipChips products have three layers. The base is a special clear adhesive designed to adhere to your car’s paint without marring its finish. If needed, it can be removed without causing damage. The second layer is clear polyurethane film. The final outer layer is a clear protective coating, which helps maintain your car’s glossy paint finish. The film itself is only 8 millimeters thick and able to stop a ¼ inch stone traveling at 120 miles per hour from damaging your vehicle.The film is covered with 2 millimeters of clear coat paint, the same type of clear coat the factory applied to your vehicle. This enhances its appearance, improves its resiliency and enables easy cleaning for years to come. This high quality product will keep the front of your vehicle (those areas that constantly get chipped by rocks) looking like new. The film is removable, so when you go to resell your car, it will look great and retain a higher resale value. 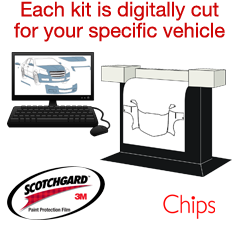 Each PPF kit is custom desgined with specific attention to a vehicle's particular impact area and is computer cut on site for your specific vehicle, assuring a perfect fit every time. Maplewood Auto Salon uses only 3M and SkipChips paint protection film, the most durable paint protection films on the market. Download the 3M Paint Protection FIlm Brochure here. For some vehicles we may have PPF kits for things like Rocker Panels, A Pillars, Fender Flares, etc. Pricing is applicable to most vehicles and includes installation. Some exceptions may apply. Includes protection for the hood & front fender leading edges (18" to 24"), mirrors, and door edges. Includes protection for the hood & front fender leading edges (18" to 24"), front bumper, mirrors, and door edges. Includes complete protection for the hood & front fenders (covers entire hood, front fenders and bumper - no visible lines), mirrors, and door edges. Maplewood Auto Salon offers our customer the choice of 3M or SkipChip brand Paint Protection Films, the most durable paint protection films on the market. The film itself is only 8 millimeters thick and able to stop a ¼ inch stone traveling at 120 miles per hour from damaging your vehicle. The product is installed by our specially trained technicians and carries a 5 Year (3M) or 10 year (SkipChips) Unlimited Mileage warranty against peeling, cracking, or discoloration and is guaranteed not to damage your vehicle if removal is ever necessary. What if I have an accident and a part of my vehicle that has PPF on it has to be replaced? Most insurance companies will even cover replacement costs of PPF should you get into a fender bender and need to repair your bumper, fender or hood, plus re-install the PPF. Does a thin film really stop rock chips and damage from road debris? Absolutely! This film will take some serious abuse without showing signs of it. There are limitations of course... The film is designed to protect against chips and small dings from small rocks and road debris, not 4" hail or a baseball bat to the car. It may still prevent paint damage but it won't stop large dings and dents. If the paint is not compromised, you would be able to repair the vehicle with paintless dent repair for much less money! The Paint Protection Film installation is a systematic process that has been mastered by our certified installers. Each installation follows the same basic steps. Customized installs will vary, but the core process remains consistent. Kit is digitally cut on site for specific year, make, model, and trim level of vehicle. These steps are the basis for every installation and have been perfected by our installers. Please feel free to contact us, our staff and installers would be happy to answer any questions regarding the installation process. Can the paint protection film be applied to anything other than vehicles? Yes, we have done a number of custom installations for boats, motorcycles and RVs. We would be happy to create a custom solution for you. Does the paint protection film require special care? No, the film can be treated just as any other surface on your vehicle. How much time is required for installation? A standard installation can be completed in about 1-4 hours, but time can vary depending on the vehicle make, model and amount of coverage selected. How long does the film take to set/cure? Paint protection starts immediately, but the film can take 2-10 days to fully adhere to your vehicle. The time will vary depending on weather, and temperature. The only limitation during this time period is no washing of the vehicle. Are there any chemicals used during the installation process that could harm my vehicle or the environment? No, the only solutions used during installation are standard rubbing alcohol, an environmentally safe soap, and tap water. Where can I receive warranty coverage for my film? Maplewood Auto Salon's installation center can provide warranty service. Warranty claims can be handled by any certified installer or service outlet nationwide. My car isn’t brand new, can I still get the protective film? Yes, brand new cars present less challenges because they have little to no current damage, but paint protection film can be applied to any vehicle. Can't I just put a car bra or nose mask on my vehicle? Car bras and nose masks are often recommended by dealers or included in purchase packages, but what value are they really adding to your new car? These hood protectors are often too small to protect the majority of the paint surface and can lead to irregular fading of the paint itself. Traditional car bras can also diminish the overall appeal of the car itself. If not properly sized and fitted, car bras can create friction and can damage the paint more than chips that rocks can cause. By choosing our highest quality 3M or SkipChips paint protection film and having it professionally installed, you are guaranteeing yourself a carefree driving experience. Stuck behind a large truck? Have to drive on a gravel road? You won’t have to worry about any of these situations when your vehicle has been equipped with the paint protection film. Our certified professional installers are trained to create perfect cut outs for your vehicle make and model and have established a process that is founded on precision. The clear film will not cause your paint to fade and is nearly invisible. Standard car bras may carry a cheaper price tag, but can end up costing you more money over time. Investing in the paint protection film and choosing professional installation from Maplewood Auto Salon can save you hundreds of dollars by avoiding unnecessary paint touch-ups or new finishes from chips, dents, and scratches that can be caused by everyday driving. By taking care of your vehicle’s paint now, you’ll have more money to spend on other accessories and automotive detail. View all our services here, including interior detailing and complete detailing packages. Find our Mapelwood shop location, map, and driving directions by clicking here.